Lauki (Bottle Gourd) Kofta With Tangy Yogurt Curry. 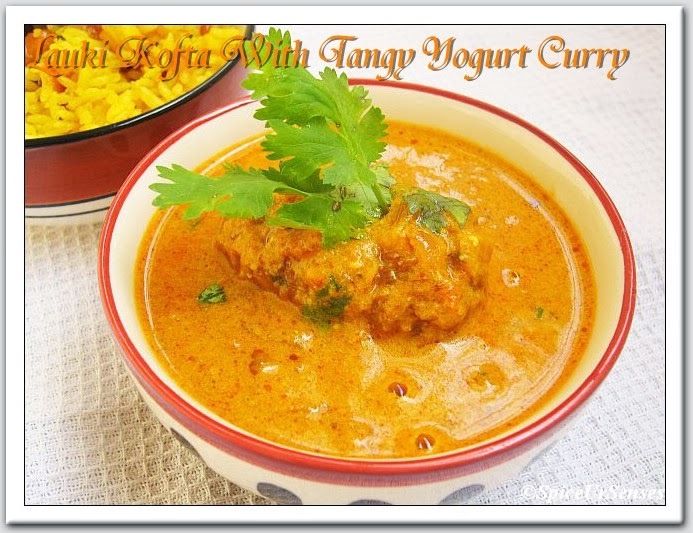 Lauki Kofta With Tangy Yogurt Curry!! I have cooked the lauki kofta curry with yogurt for the first time and it turn out to be the best and yummy curry.. 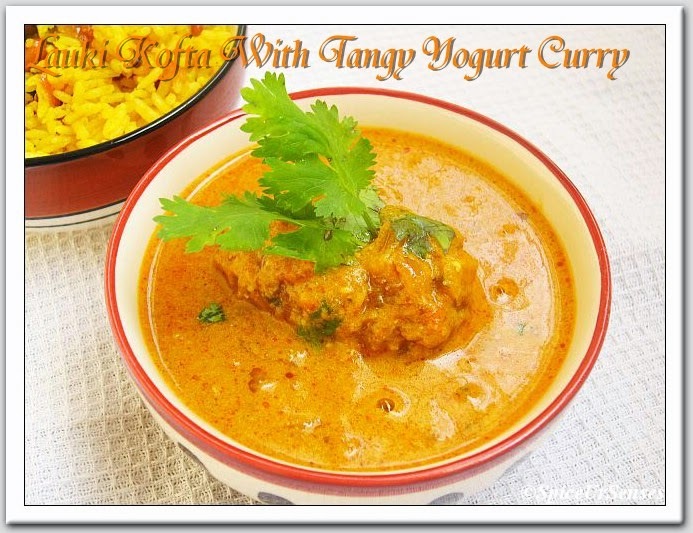 I usually cook any rich gravies by adding cream or a milk but adding yogurt to this curry it gave a very nice texture and tangy taste and it was going very well with hot rice.. i simply love it... Every time i cook any kofta curry in my family everyone loves it, even i feel good because i don't have to cook any other side dish, this will do both the job, we can eat with Roti's and Rice too.. Drain and let it cool down,then squeeze the water from the bottle gourd (reserve the water to use in the gravy). Take bottle gourd in a bowl and add gram flour, corn flour, salt, chili powder, pinch of garam masala, 1/ 2tsp grated ginger, and chopped raisins. Grind the tomatoes with 2 green chilies, ginger and make a smooth puree. Now add turmeric, chili powder, salt, coriander powder and mix well and cook for few seconds. Blend yogurt with 1.5 cup water and add in the gravy. 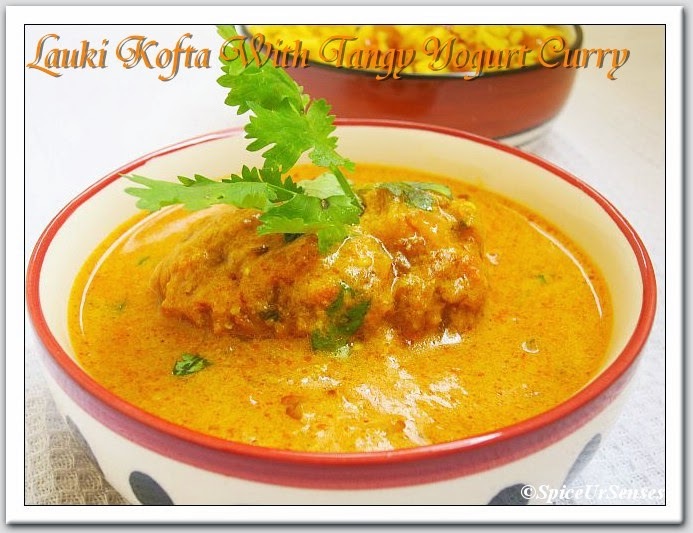 Cook for approx 5 minute on low flame, now add koftas and cook for a minute. 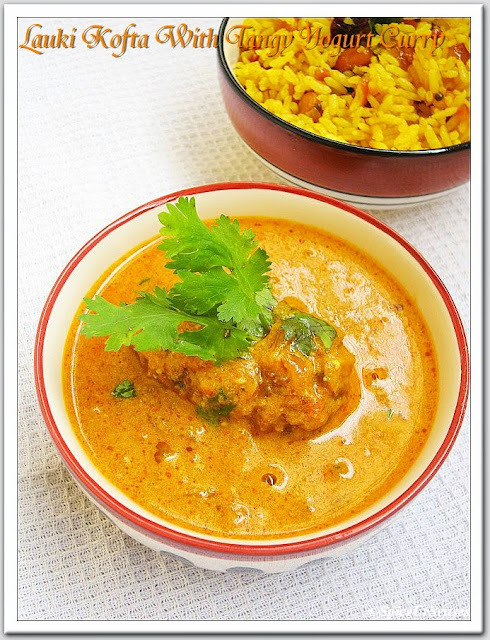 Add fresh corinader and serve hot, garnished with Rice Or Roti's. The koftas look awesome. Love the color. Rumana, I am here after a very long time. Your space is filled with amazing and colorful recipes. Hope to be a regular visitor here now. I hope the same dear.. Thanks..
Yum! I can almost feel the tangy curry rolling on my tongue. Lovely post. This perfect combo looks so yum! Yummy luking gravy vth tempting cliks. Wah, I am in awe of this dish :) lauki is bit costly here, but I would try this for sure :) thanks so much !! !